Karen recently wrote to share her tattoo story. 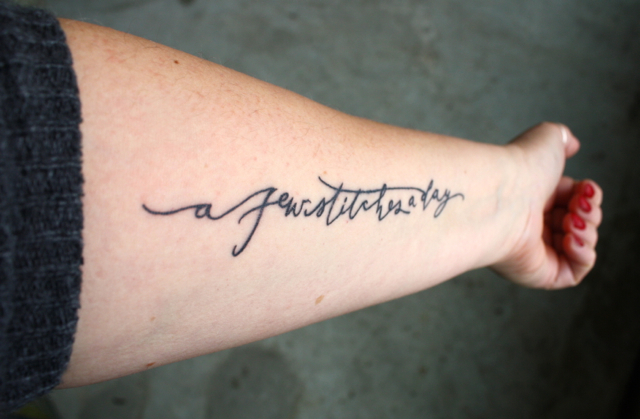 Nearly every tattoo represents a daily reminder of something or someone, and I love that Karen chose this simple phrase that speaks to her vocation. My tattoo is almost healed - should I say "our" tattoo, as you did the most important part? I really love it. I finally found my vocation, and knitting "a few stitches a day" is part of my life, part of me... I love being able to express my creativity in my knitting designs. And it's so much better than the "infinity sign tattoo" that I had in mind at first. Thanks again for your amazing work, it was a pleasure to work with you - your did an amazing job by mixing different fonts for me. Thank you to Karen and Kate!